What is the most important tool you need for success in chess? Amazingly enough, the same one tool can help you achieve success in chess, money, and life in general. Life never remains static. As technological, industrial, and political changes alter our landscape, new theories of “the best” develop. Similarly, in chess, the style of play evolved over the centuries. New rules, openings, middle games, and endgames all developed. Today, you can play the game according to a variety of styles and techniques. Nevertheless, your efforts to succeed in chess, investing, or anything else will only be effective if you first develop a strategy and the tactics needed to implement it. It really doesn’t make a difference what theory or goal you want to achieve, since the tactics that you use are what will make all the difference. 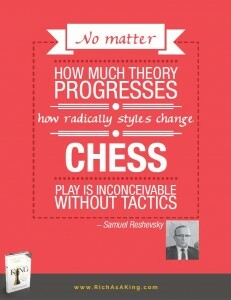 Here’s one tactic for success: Keep inspirational chess quotes like Samuel Reshevsky’s nearby. Download the Rich As A King poster book here and enjoy the posters.